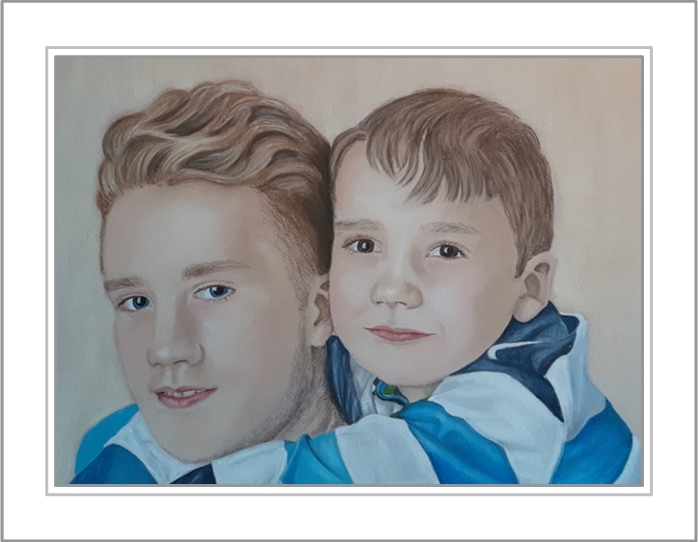 I wanted a portrait painted of my two boys together as I have lots of professional photos of my older son but very few of them together. The picture I chose was from a photo shoot – I wasn’t too pleased with the lighting but it was the best shot I had of them together without them pulling silly faces! The result of turning the photo of my two boys into a painted portrait is just gorgeous. Susan took the time and trouble to ask about tiny details on their faces and then brought their characters to life in pastel. The photo of the two of them together is nice but the portrait is just stunning. The first time I saw it, it made me gasp and each time I look at it, it stops me in my tracks. It really is a beautiful portrait to treasure. Susan was easy to deal with, professional and quickly produced the portrait as a gift for my husband who was delighted with it. She is an extremely talented lady! Thank you – I really am delighted with it!